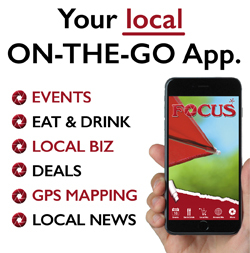 FOCUS has three different media to advertise on. One or all will definitely fit your budget! The App is FREE to download. It’s available on the iTunes App Store or Google Play Store. Events | Eat & Drink | Local Biz | Around Me | Deals and Much More! All advertisers receive hot links to all of their contact information. with 100,000 readers a week. Contact sales for more information about advertising! Need Help With The App? Watch the support videos here to help you get the most out of your App experience.